I told myself I wasn’t going to play around with the 1940 U.S. census images today. “Wait until later in the week,” I said. “You’ve got other things you need to do today.” But, after seeing colleagues posting their success, I was tempted to take a peek. I had already prepared by doing the one-step program developed by Stephen P. Morse, PhD and Joel D. Weintraub, PhD (http://stevemorse.org/census/quiz.php). I had already set client expectations that this could take several days or even a week or two. If I were going to be efficient, I would set the census searching aside and devote today and tomorrow to other projects. I started off on this track, but caved in after three hours of work this morning. Now I am waiting for my first image to load. It has been about 15 minutes and I have 20 images within the first enumeration districts (E.D.) I need to check 2 or 3 E.D.s for this particular client. Not the most efficient way of searching. While I was waiting for the first image to load, I tried to think back to 2002 when the 1930 U.S. census was released. I was expecting my first child and I remember I took the day off work and went to my local NARA branch office to look at it on microfilm. I spent the entire day there. I recall searching through the entire city of Baltimore. I had found them in a city directory, so had a general idea of the street name. It took time and patience, but I found them. This success encouraged me to look for others that day. It was thrilling to share my findings with my family. After about an hour, I gave up trying to bring up the image I needed from NARA. I checked a random page from Rhode Island on Ancestry.com, just so I could see “the real thing.” So I can wait a few days to get the 1940 images I need. I don’t have to drive an hour to the archives and slog through miles of microfilm. Although I suppose microfilm searching would be faster than waiting for images to load, I am sure the archives branch would be packed with people and with a long wait for microfilm machines. I can wait a little while. How about you? It seemed like an eternity before we received the results, but it was only a bit longer than a month. As I opened the envelope, I became worried. What if I hadn’t scraped enough cells off the inside of Ziggy’s cheek? What if he was such a broad mix of breeds that no breeds showed up on the test? Fortunately I was not disappointed. Ziggy appears to be largely a poodle, with some English Setter, Golden Retriever and a trace amount of Boston Terrier. I ran to call Maile. “What? No Newfoundland?” We were both surprised and suspicious. But after a week or so, Maile texted me back. She could see the breeds in Ziggy now. At this point, I’m wondering what this has to do with genealogy. I’m just a sucker for clever marketing, I guess. © Corey Oiesen, Genealogy Heroes, 2010. I headed over to her house. I should admit here that, in general, I’m afraid of dogs. Ziggy, who I hadn’t met before, was the largest dog I’ve ever seen. His back along seemed to be 5-feet long. 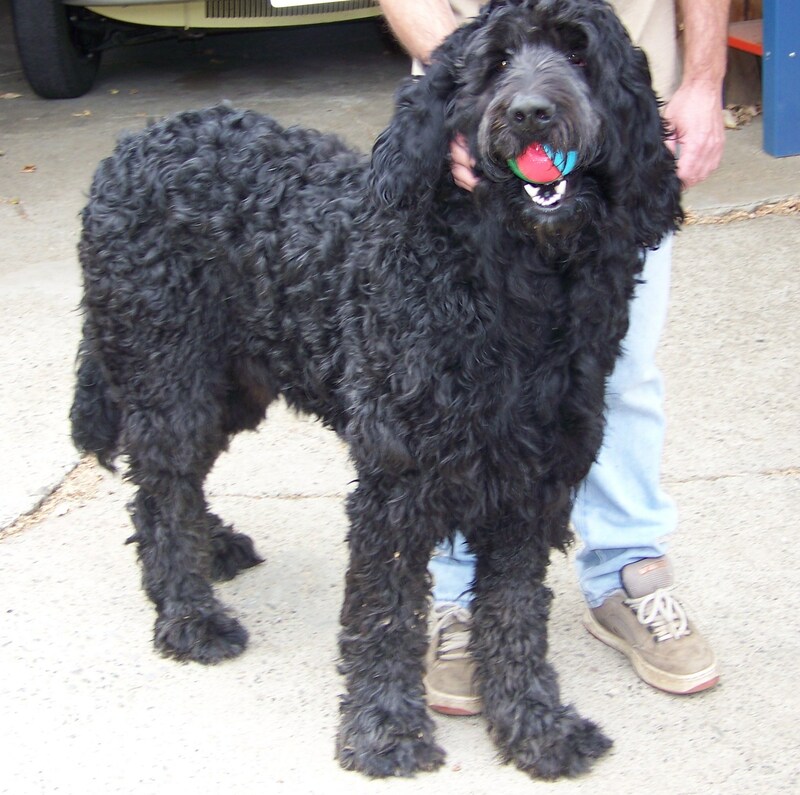 Newfoundland and standard poodle? I was thinking part bear, part horse. Fortunately Ziggy was a gentle giant. I had failed to notice that you have to wait to give the test until 30 minutes after the dog had last eaten. Maile and I chit-chatted while Ziggy paced back and forth in the kitchen which, for him, was only three steps forward, three steps back. I’ve swabbed my own cheek for my DNA test, but have never gotten so close to a dog’s mouth. At least not on purpose. Maile pried his mouth open. 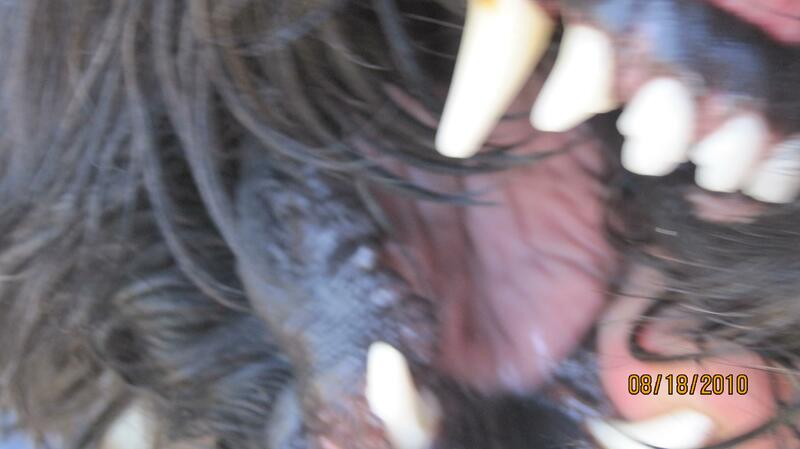 The inside of his mouth, except for teeth and tongue, was solid black. I could hardly see what I was doing. I had to swab the inside of his cheek for 30 seconds. That’s a long time for a dog to sit still with his mouth pried open. I had to do this right, because the thought of retesting was not appealing to any of us, including Ziggy. I sealed up the package and mailed it. Later, I uploaded a photo of Ziggy that Maile had sent me. 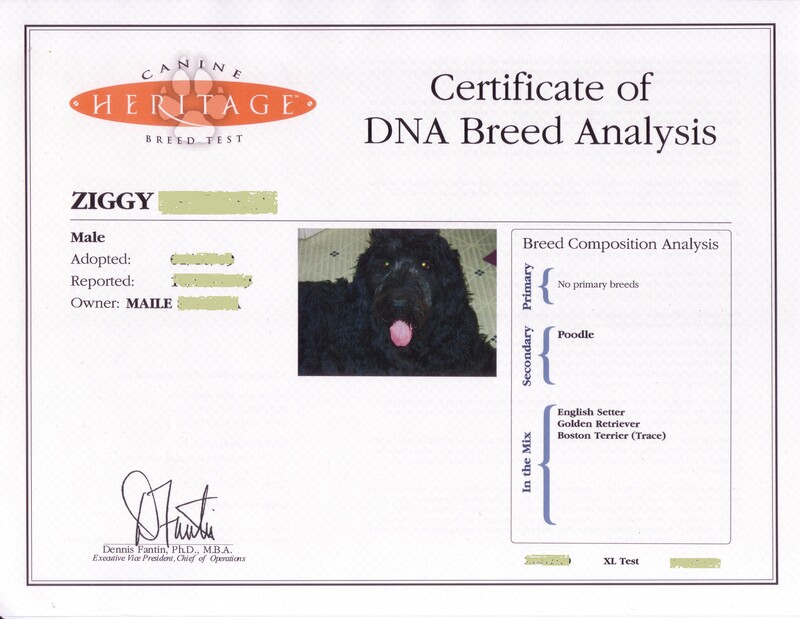 This will go on his official DNA breed analysis certificate. Come back tomorrow for the results. Genealogy for dogs? Have we lost our minds? If you’ve browsed the Sky Mall catalog recently, you may have seen the Hammacher Schlemmer® Canine Genealogy Kit. http://www.hammacher.com/Product/77449 Yes, it’s serious. This DNA kit includes a swab that you scrape on the inside of your dog’s cheek, put the swab in the envelope provided and mail it to the library. 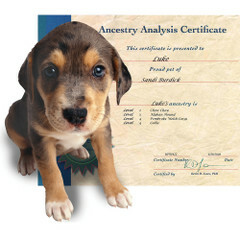 Three weeks later you receive a certificate that lists Rover’s genetic profile and breeds. At first I thought, “I know people love their dogs, but this is ridiculous.” So I called my friend Maile. “Can I give your dog a DNA test?” Of course I had to try it. “Sure,” she agreed. She and her husband Pat had wondered about the breed of their new pound puppy Ziggy. I did some searching online and learned that it is a breed test – not that it indicates dogs from common ancestors like many of the human DNA projects going on today. I chose one of the brands (Canine Heritage) that tested for a high number of breeds – 100 breeds. Tune in tomorrow for the testing. Caption: This is the image for “dog genealogy” in the SkyMall magazine that caught my eye. I wound up using a test by Canine Heritage. • Start with ‘what you know’ and move back in time. • Have a research plan before visiting a repository. • Be polite and respectful of the staff. I know these rules. I follow these rules — at least in the U.S. Today I broke all of these rules. I had found out almost at the last minute that I was going to the Czech Republic for work. I quickly remembered the Czech genealogy project in my back pocket, waiting for me to have time to work on it. I quickly started my research, but only have the family in question traced back to the late 19th century – and still in the United States. At this point, it would be futile to do research during my brief free time in Prague. Despite this, I decided to go visit the Czech National Archives. I figured I would just see what it was like — and perhaps poke around if they had a browsing library. I prepared by reading the website for the archives. I also took a chance and entered my client’s last name in the database, but got no results. Since I only speak the bare minimum of tourist Czech, I found a list of helpful vocabulary words at FamilySearch.org. The archives are housed in a beautiful, new building in the southern part of Prague. Like any archive, you really need to know what you’re looking for, in order to ask the staff members, who then bring you the book, manuscript or microform. Staff members there at the time did not speak much English, but were eager to help me. I felt a little guilty about wasting their time, since I was only there to look around. Fortunately a Czech genealogist who speaks English (thanks, Karel!) was there and helped me out. He explained the purpose and how to use the county/parish books I had randomly picked up. This helped me do a little exercise of looking at the county/parish formations and then finding them on the map. Basic, but at least I learned something! Was my trip a waste of time? I don’t think so. I made contact in case I need to hire a genealogist in the future. And I now know the rules of the archives if I ever go back. I’ve come to the conclusion from my recent trips that genealogists are nice all over the world.